The Italy Economic Development Corporation voted to move forward with the third phase of the downtown improvement project by redirecting initial plans to build a new community center to purchasing an existing building located at 161 W. Main Street for the same purpose. The Italy EDC will have a public hearing on Monday, October 24, 2011 at 6:30pm regarding Phase 3 of the Italy Community Center Improvements Project. City of Italy’s Mayor Frank Jackson once again proclaims October 11, “IYAA Day,” within the City of Italy. Members of the IYAA family (Italy Youth Athletic Association) joined Mayor Jackson to celebrate the proclamation. Refinancing of General Obligation Bonds for Ellis County will generate a savings of $272,663.66 over the course of the next four years, without extending the period of debt on the bonds. Planning and preparation were obvious in the expert response to Monday’s devastating fire at the Magnablend chemical plant in Waxahachie – a response that averted potential human tragedy. The Italy City Council refinanced its 2002 bond Monday night at its monthly council meeting reducing the interest rate from 5.39 percent to 2.39 percent. The Italy Park Board spent a good portion of its 1-1/2 hour meeting outlining vendor rules for the Christmas Festival scheduled Saturday, Dec. 3, in downtown Italy. The City of Italy Park Board will have their monthly meeting today, Tuesday, October 4, 2011. The meeting will be held in the Council Chambers of the Italy Municipal Building at 105 West Main Street, Italy. Meeting time is 5:30pm. The agenda slates the Christmas Festival as the lone planning session item. Did you ever wonder why the City of Italy has an ordinance for dog and cats at large? The Italy Economic Development Corporation spent 40 minutes in executive session to discuss “real property” at a meeting Monday evening. However, the board took no action on the item once they returned to open session. 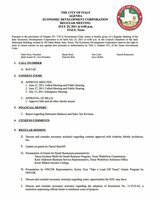 The Italy City Council was busy Monday night as they approved a budget for the fiscal year 2011-2012 and issued certificates of obligation at its regular meeting Monday night. 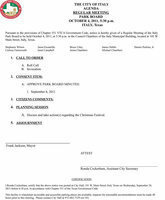 The Italy Park Board assigned members to prepare for the upcoming Christmas Festival scheduled Saturday, Dec. 3, in downtown Italy. 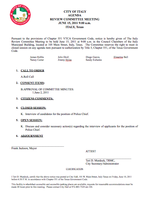 The City of Italy Park Board will have their monthly meeting today, Tuesday, September 6, 2011. The meeting will be held in the Council Chambers of the Italy Municipal Building at 105 West Main Street, Italy. Meeting time is 5:30pm. The agenda slates Christmas Festival planning as a lone planning session item. Ellis County Commissioners took the next step in the annual budget process during their regularly-scheduled meeting on Monday, August 22, by taking a record vote regarding the tax rate for fiscal year 2011-2012. The Italy Economic Development Corporation voted to enter into negotiations for real property at a called meeting Monday evening. During a special meeting on Tuesday, August 16, Ellis County Commissioners opened discussions regarding very difficult budget decisions that must be made in the next few weeks. 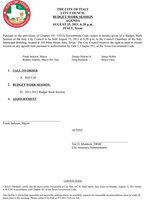 The Italy City Council will have a work session to discuss the 2011-2012 budget on Monday, August 15, 2011. The meeting will be held at the Council Chambers, 105 Main Street, Italy. Meeting time is 6:30pm. Constable Terry Nay and Deputy Constable Brad Elliott were recognized in Commissioners’ Court on Monday morning for their part in the EPA Regional Emissions Enforcement program Achievement Award received by the North Central Texas Council of Governments. The Italy Volunteer Fire Department is requesting cases of donated water and gatorade from the community. The Italy City Council named James Hobbs as replacement for Mark Souder Sr. who resigned his seat on the city council at its regular meeting Monday evening. The Italy City Council will have its regular monthly meeting today, Monday, August 8, 2011. Meeting time is slated for 6:30pm and will be held in the council chambers at 105 West Main Street, Italy. 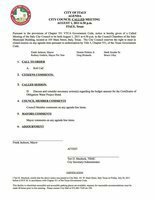 Agenda items include naming a replacement for the recently resigned council member, Mark Souder, Sr. The Italy City Council moved forward with the issuance of Certificates of Obligation for a water project bond at a called meeting Monday evening. 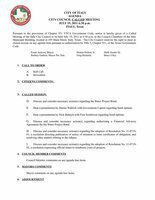 The Italy City Council will have a called meeting on Monday, August 1, 2011 at 6:30 p.m. 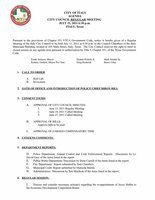 The council will discuss and consider necessary action(s) regarding the budget amount for the Certificates of Obligation Water Project Bond. 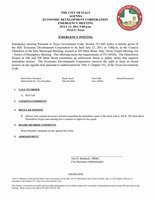 The meeting will be held in the Council Chambers at 105 West Main Street, Italy. The Italy Economic Development Corporation discussed options to assist connecting water lines between the City of Italy and South Ellis County Water in the event of an emergency. The Italy EDC will have their monthly meeting on Monday, July 25 at 6:00pm in the Council Chambers of the Italy Municipal Building at 105 Main Street, Italy. There will be a presentation regarding small business grants as well as a full slate of other agenda items. Local business owners and their representatives are invited to the Italy Economic Development Corporation’s monthly meeting on Monday, July 25, at 6:00 p.m. 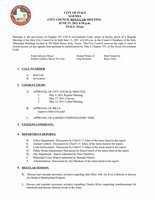 The Italy City Council approved a resolution (#11-0719-01) to issue certificates of obligation, not to exceed $3.1 million, regarding a water project bond Tuesday evening at a called meeting in council chambers. Free online search is now available for information managed by both the County Clerk and the District Clerk in Ellis County. The Italy City Council will have a called meeting on Tuesday, July 19, 2011 at 6:30 p.m. The council will discuss the Water Project Bond and hear presentations regarding bond options as well as other agenda items. An emergency EDC meeting was called on Wednesday evening to discuss and consider necessary action regarding the immediate repair to the brick wall at the 100 and 108 Main street demolition project. There will be an emergency meeting of the Italy Economic Development Corporation on Wednesday, July 13 at 5:00pm. The meeting will be held in the council chambers at 105 West Main Street in downtown Italy. The agenda states that the demolition project of the Community Center at 100 and 108 Main Street constitutes an unforeseen threat to public safety that requires immediate action. 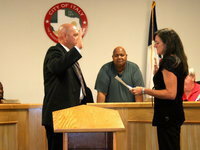 At the City Council meeting Monday evening Diron Hill was sworn into office as the new Police Chief of Italy. The room was full of the new chief’s family and friends all there supporting him as he was sworn in. The Italy City Council will have their regular monthly meeting on Monday, July 11, 2011 at 6:30 p.m. The city’s new police chief, Diron Hill, will take his oath of office during the meeting. The agenda slates the usual department reports as well as a regular session item regarding the re-appointment of Joyce Hobbs to the Italy EDC. The City of Italy is issuing a Mandatory Water Conservation Emergency. No washing cars, watering lawns, or filling swimming pools. You will be notified when the Mandatory Conservation is lifted. Redistricting is a word seldom used, except once every ten years. On Wednesday, July 6, 2011, at 6:30 p.m., the public is encouraged to attend a public hearing on redistricting in the Commissioners’ Courtroom on the 2nd floor of the Historic Ellis County Courthouse on the square in downtown Waxahachie. The Italy Park Board began preparations for its annual Christmas Festival Tuesday at a called meeting in council chambers. Last night at a called Italy City Council meeting the question was asked, “How long will our water system last?” Dean Carrell (Public Works Director) tried to answer this question with a power point presentation and explained how some equipment just didn’t work any more, how there were too many repairs being done to the point where they will not be able to be repaired again. Fewer than a dozen residents showed up at an Italy Economic Development Corporation called meeting and workshop Monday to express their preference in the construction of a proposed community center in Italy. 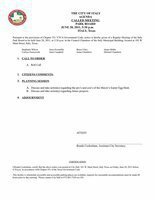 The City of Italy Park Board has scheduled a called meeting for Tuesday, June 28, 2011. The meeting will begin at 5:30 p.m. in the Council Chamber at Italy City Hall, 105 W. Main Street, Italy. The Italy City Council will have a called meeting on Monday, June 27, 2011 at 6:30 p.m. The agenda slates there will be a Power Point presentation by Dean Carrell regarding the Water Project, Cost Estimate and Financing. The Italy Economic Development Corporation is seeking public input regarding the construction of a community center. The Italy Economic Development Corporation moved one-step closer toward constructing a community center after a two-hour called meeting and public hearing Tuesday evening. The Italy City Council approved an Air Evac Lifeteam ambulance membership service at its regular meeting held Monday evening in council chambers. There will be a City of Italy Review Committee Meeting on Wednesday, June 15, 2011 at 9:00 am. The meeting will be held in the Council Chambers of the Italy Municipal Building, 105 Main Street, and is open to the public. There will be a regular monthly meeting of the Italy City Council on Monday, June 13, 2011 at 6:30pm. The meeting will be held in the Council Chambers of the Italy Municipal Building, 105 Main Street, and is open to the public. Italy, Texas – 06/10/11: Whether you know it as the American Legion Hall, or the Cargill-Gallman Community Center and Museum, or the Italy Community Center, one of the central focal points of downtown Italy has overseen its last parade, hosted its last community event and will be casting its final shadows as demolition of the structure began early this morning. The Italy City Council approved a plat change for the Mt. Gilead Baptist Church Tuesday night at a called council meeting. There will be a called meeting of the Italy City Council on Tuesday, May 31, 2011 at 7:00pm. The council will discuss and consider necessary action regarding the plat approval of the Mt. Gilead Baptist church addition. The meeting will be held in the Council Chambers of the Italy Municipal Building, 105 Main Street and is open to the public.